Trips to Bombalia is a series of videos created by the audience from the show Paper bubbles by Múcab Dans company. 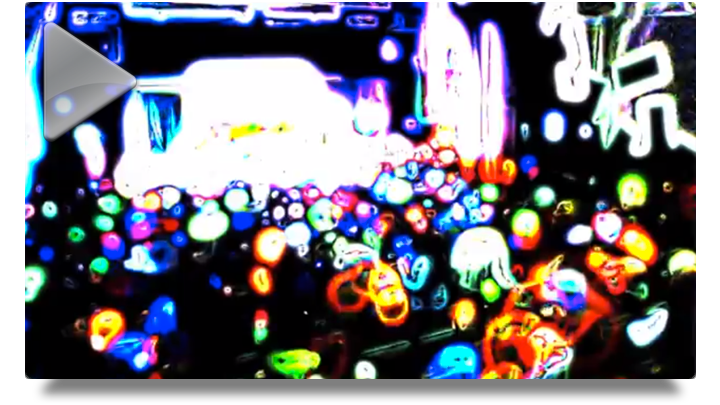 A visual, alive, magical, rhythm and color, picture generated in real time by children and adults who have enjoyed the adventure of Roger and Bumbú, sharing a journey full of bubbles with them. A gift from Múcab Dans to the audience of Paper bubbles so always remember this experience. At the end of the show Paper bubbles we interact with the audience who, with phosphorescent balloons, black light, live music and dance create an alive, visual, magical picture, in real time and full fo color, which is projected in live, recorded in video and it will send them by email.. A fantastic souvenir to don't forget their trip to Bombalia, the world of bubbles.